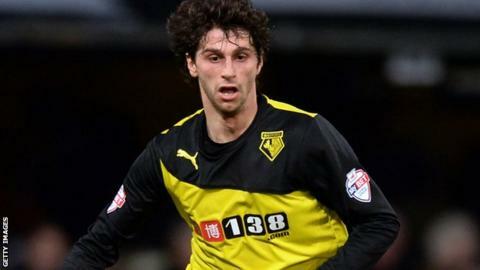 Championship strugglers Millwall have signed Watford forward Diego Fabbrini on a 93-day loan deal. The 24-year-old, who has not featured for the Hornets since September, will be with the Lions until 19 April. Fabbrini, who has one international cap for Italy, joined Watford in 2013 from Udinese who, like the Hornets, are owned by the Pozzo family. He has previously had spells at Empoli and Palermo and spent time on loan at Siena last season. Fabbrini becomes Millwall's fifth signing of the January transfer window. Paris Cowan-Hall, Dan Harding, Stefan Maierhofer and Shaun Cummings have already moved to The Den this month.